The Rev. Woldemar Emil Arthur Sibbul, son of merchant Georg S. Sibbul and Elisabeth Makkar, was born in Dorpat (now Tartu, Estonia) on August 25, 1869 and died February 16, 1947 in Berlin. He was married in Saratov, Russia on January 10, 1901 to Olga Kindsvater, daughter of Alexander K. Kindsvater and Natalie Müller. She was born in Saratov on October 26, 1878 and died in Hamburg, West Germany, on December 14, 1972. Sibbul graduated from the Hugo Treffner Gymnasium in Dorpat and went on to study theology at the University of Dorpat from 1891 to 1896. 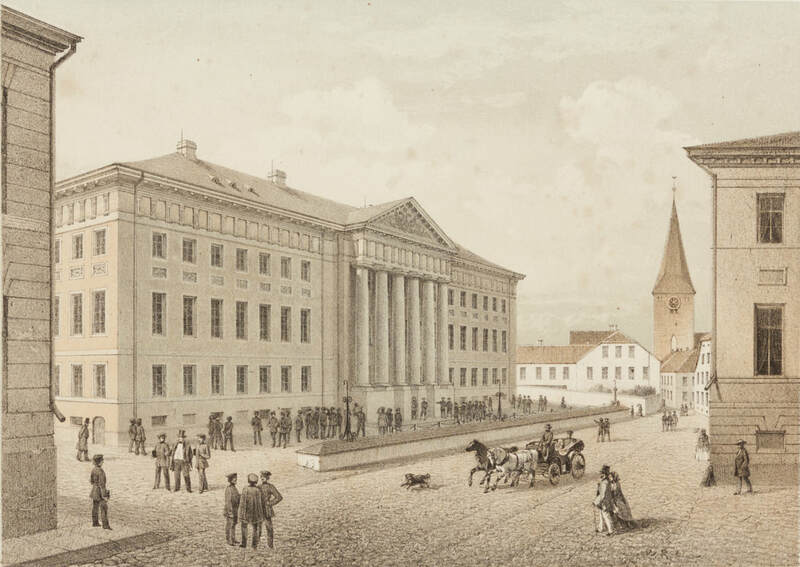 The University of Dorpat in 1860. Source: Wikimedia Commons. Rev. Sibbul was ordained on February 9, 1897 in Norka and was assistant pastor to Rev. Wilhelm Stärkel from then until 1901. He then served from 1901 to 1920 as assistant pastor in Irkutsk, Russia. From 1921 to 1925 he was an instructor of religion at the Cathedral School in Reval (now Tallinn, Estonia). He also served as pastor vicar at the Cathedral School and continued as pastor there until 1939 and also served as the supervisor of the Evening Middle School. Amburger, Erik. Die Pastoren Der Evangelischen Kirchen Russlands Vom Ende Des 16. Jahrhunderts Bis 1937: Ein Biographisches Lexikon. Lüneburg: Inst. Nordostdt. Kulturwerk, 1998. 475. Print. Schnurr, Joseph. Die Kirchen Und Das Religiöse Leben Der Rußlanddeutschen. Stuttgart: AER-Verl., 1978: 172. Print.